This is a dish I call “Ducks in the Orchard” that invented for the Duck Off, a friendly cooking competition I had with the head chef at Sacramento’s Grange restaurant, Michael Tuohy. 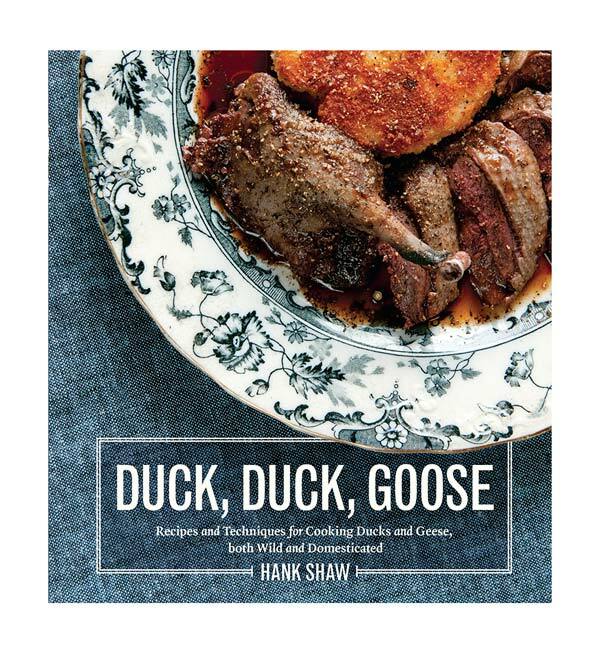 I wanted to combine duck with apples — a classic combination — in a new way, and I wanted to serve the judges some duck breast, which I thought they’d want; after all, breasts are the most accessible part of the bird. This is a simple preparation that works just fine with domestic duck. Remember, because you slice those apples thin, it only sautes in the duck fat for a few minutes. Don't overcook or they will get soggy. I like to serve this as-is on the plate because it's pretty, but you can serve it alongside wild rice, mashed or roasted potatoes, or even just some good crusty bread. A simple green salad is a good vegetable here. 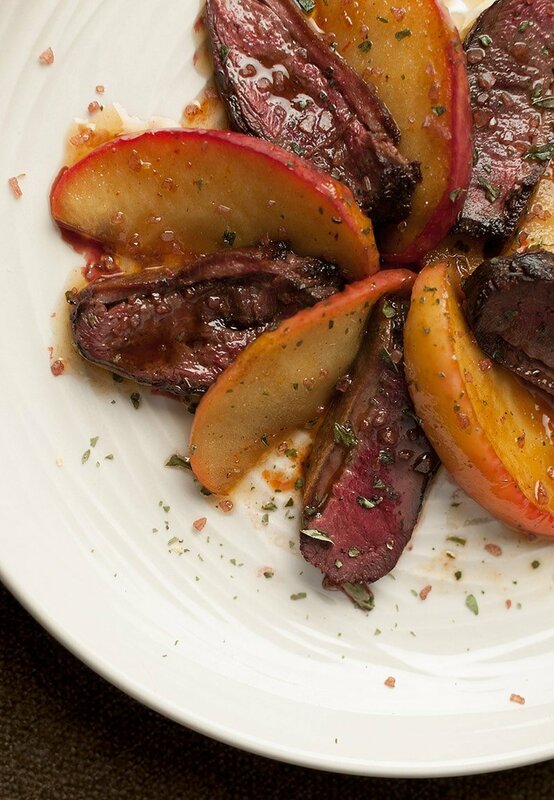 Take the duck breasts out of the fridge and salt lightly. Let sit at room temperature for 25 minutes. Squeeze the lemon juice into a bowl of water. Slice the apples into quarter moons of about 1/4 inch thick. Do not peel. Drop each slice into the lemon juice and make sure all sides are coated to avoid browning. Heat a large saute pan over high heat for 1 to 2 minutes. Add the duck fat or butter and swirl to coat the pan. Place the duck breasts skin side down, turn the heat to medium and cook for 5 to 8 minutes, until golden brown. Turn over and cook for another 2 to 4 minutes, depending on how you like your duck. Remove the duck breasts and tent loosely with foil. Let them rest while you make the sauce. Spoon off all but about 3 tablespoons of fat. Cook the apples over medium-high heat; do not crowd them. Brown the apples lightly on both sides. When you flip them, sprinkle the brown sugar over everything and swirl to combine while the apples continue to cook for 1 to 2 minutes. Pour the cider in the pan and put the heat up as high as it will go. Sprinkle a pinch of salt and the cayenne into the pan and boil this furiously until it cooks down by two-thirds. Slice the duck breast pieces roughly the same width as the apples. 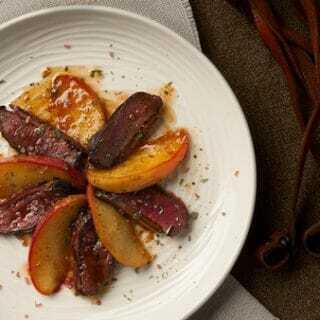 To make the dish, make a rosette of alternating duck breast and apple in the center of the plate. Spoon a small amount of the reduced cider on each piece of duck, then one more spoonful in the center of the rosette. Sprinkle with the fresh mint and the Hawaiian red salt. Serve at once. Just made this with a side of Green Beans. wow, Yum! And, so easy. Thanks for this recipe. My husband saw your blog and said he used to follow you a good few years ago. I just followed your Instagram – you’re an inspiration for our farm (we are crownhillfarmny). I have made this recipe numerous times with wild duck and it was absolutely fantastic long every occasion. I have some wild goose breast (skin off) which I am going to try this recipe on. Any advice? Dave: Sure. My advice is to take the goose breast out of the fridge and salt it. Let it sit for 30 minutes. Sear on the (former) skin side as you would if it had skin, so that side gets the hard sear. Flip and use the finger test for doneness to determine when it’s ready. Basically, a skinless goose breast is exactly like a beef steak. Slice it thinner than you would duck breast, as it might be tougher.